Solvency is the ability of an economic unit to pay its debts or liabilities as they become due. A bank is to be financially solvent. Financial solvency of bank is expressed if its own fund (own capital + loaned capital) is high that means minimum 10 millions of money as paid-up capital for each commercial bank. Liquidity means the capacity to pay cash on demand. A bank is to have or preserve necessary liquidity to its volt to meet on-spot demand of its clients. The duty of bank is to ensure the safety and security of deposited money and precious assets of clients. Safety of funds is the first and main principle of investment. If bank becomes failure to ensure the security of money, the confidence of mass on bank is not achieved. Bank tries to be reliable to general people performing its jobs with honesty. If any bank faces the questions of honesty and reliability, it can't exist to competition with other. So, every bank must do its job with the most honesty & reliability. The establishment, favourites and goodwill of bank depends on better services & variety of services providing. This is why bank is to ensure better and maximum services for its goodwill. Well discipline and variety of services shows the efficiency of bank. So, the bankers are to effectively & efficiently perform their jobs. A efficient management can gain the success, Goodwill & prosperity of bank. Depending on the quote 'Widening depends on publicity', bank is to highly & vigorously advertise itself as well as its products have already been newly arrived for clients and mass. The success of bank depends on gaining profits and bank exists into competition through profits. So, bank also highly try to maximization of profits through distribution of loans at higher rate of interests than the interest given to the depositors at lower rate. Sometimes the success of bank depends on its location. So, its location should be the most secured, at commercial & industrial area, at prosperous, recognized, developed and important places where better communication is available. The duty of bank is to maintain the secrecy of assets and account of its clients. Because, every client wants to hide the information of his assets. So, bank will only disclose it according to the necessity of clients and moreover when the court wants to know it. Credit policy of back Will be combination of easy conditions, more safety, on handsome amount and to authentic clients. Specialization means to achieve adeptness on specific or particular area. In this principle, bank will create and provide special offers, separate opportunities, exclusive services or schemes and moderate thinking which will express to a bank exclusively. Goodwill means to gained skill and discipline of long period of time. According to the principle, bank will try heart and soul to achieve goodwill and to preserve that gained goodwill. Bank should be more economy in every stage of every sector so that the amount of its profits should be increased. Bank should invest its funds to more profitable and welfare fields and areas so-that the confidences of clients on bank should be lift up. Bank has to build up modern and technology dependent products and services to adapt & exist with the competitive world or market. At last it is said, the success of bank depends on principles. The bank which is capable to establish more principles and ideality can earn maximum success. 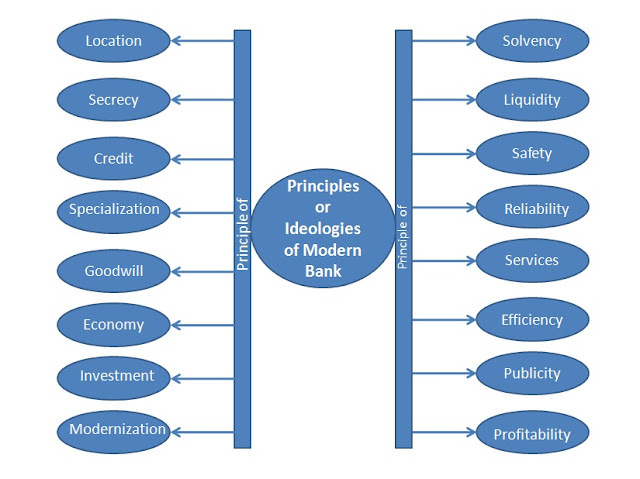 Principle and ideologies of modern bank are so good and are really productive for all of us. There are many people who are linked with top essay writing service and they will understand these ideologies. This blog is composed for active readers.